Landowner Rights & Fracking: Who Will be Impacted? Based on the geography of the shale basins in North Carolina and the experiences of landowners in other states, rural landowners and farmers are most likely to be negatively impacted by this industry. Rural landowners and farmers in North Carolina shale-bearing counties are not well informed of the potential risks of hydraulic fracturing to their land. Gas companies are not providing objective information about the benefits and drawback of natural gas extraction. Many are not consulting an attorney before signing a lease. There are over 2,100 farms in Chatham, Lee, and Moore Counties accounting for over 220,000 acres of farmland. Approximately 59,000 acres in rural Lee County alone are expected to be targeted for drilling, with unknown additional acreage in Chatham, Moore, and Durham Counties. Over 9,400 acres in Lee County have already been leased by gas companies under predatory mineral rights leases. Considering Leasing your Mineral Rights? If you are a farmer or landowner in Lee, Chatham, or Moore Counties in North Carolina, you may be approached by companies interested in leasing your mineral rights and tapping potential natural gas deposits beneath your land using hydraulic fracturing, commonly called fracking. Always speak with a lawyer when considering signing a lease. Hydraulic fracturing and horizontal drilling have been used in parts of the Midwest for years, and are now being used in Pennsylvania and New York as well. Landowners and farmers in these states have expressed concerns about the effects that drilling have on their lives and livelihoods. Compulsory pooling is used by oil and gas companies to force unleased or non-consenting landowners into oil and gas leases. It is used when oil and gas operators are unable, through voluntary agreement, to meet the acreage requirements for forming a drilling unit. 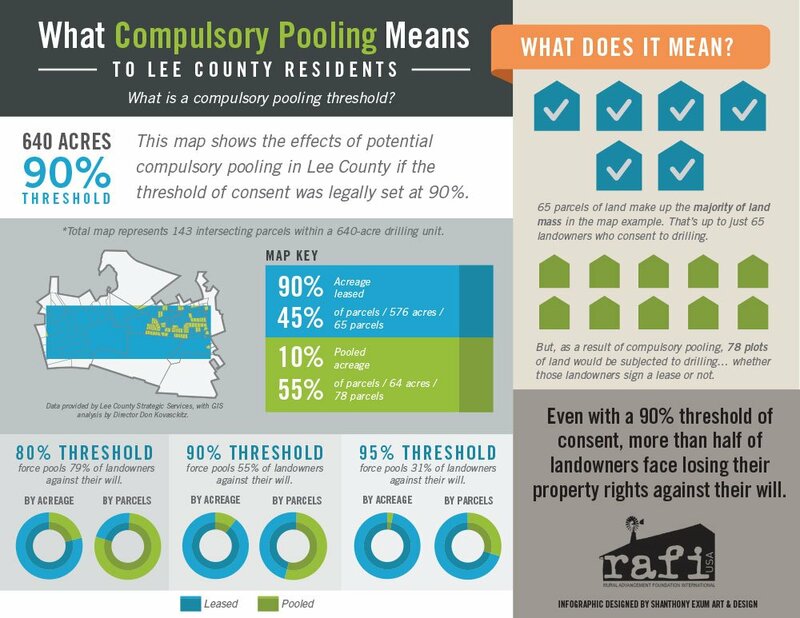 Compulsory pooling can result in the loss of your property rights and allow oil and gas companies to force the leasing of your property. Below is a helpful infographic we created to explain the issue. As you can see, even with a 90% threshold of consent for drilling, more than half of area landowners could be pooled against their will. Forced Pooling; Can North Carolina Landowners be Forced into Signing Mineral Rights Leases?